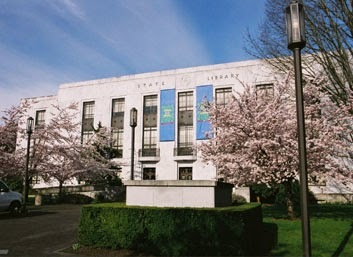 It’s always sad when we hear about a library closing and when we are talking about the reference room at a state library that just seems to compound the pain. Just today, I spent hours in the reference room at the State Library of North Carolina, on the mezzanine level of the building, looking at books from several Virginia counties, some North Carolina counties with a bit of Revolutionary and South Carolina Baptist books thrown in for fun. I cannot imagine not having access to this collection whenever I start a genealogical journey. This collection of books is critical to the research I do. Well, unfortunately, come 1 October, those visiting the Oregon State Library will no longer have access to the reference room collection. Read Salem genealogy, history buffs are losing a hidden gem to learn more about the history of the room and its collection, the volunteers who have kept it running and why it’s becoming unavailable. Here is the Message from the State Librarian About the Reference Room. This just reminds us that there are collections to which we currently have unfettered access which may be at risk of also closing. So, let’s take a moment and appreciate our community and state libraries and the services they do provide to us. How would you feel if they all of a sudden disappeared?